Your sciatic nerve is your longest and largest nerve. The sciatic nerve is made up of five roots that leave your low back, join in your pelvis and then travel to the muscles and joints of your thigh, knee, calf, ankle, foot and toes. If your sciatic nerve becomes inflamed, the condition is called sciatica. 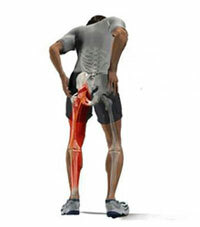 Pain from sciatica can be intense! It often follows the path of your nerve-down the back of your legs and thighs, ankle, foot and toes-but it can also radiate to your back. Along with burning and sharp pains, you may also feel nerve sensations such as pins-and-needles, tingling, prickling, crawling sensations or tenderness. Ironically, your leg may also feel numb! To complicate matters, although sciatica pain is usually in the back of the legs or thighs, in some people it can be in the front or side of the legs or even in the hips. For some, the pain is in both legs: bilateral sciatica! The quality of the pain of sciatica may vary. There may be constant throbbing but then it may let up for hours or even days; it may ache or be knife-like. Sometimes postural changes, like lying down or changing positions, affect the pain and sometimes they don't. In severe cases, sciatica can cause a loss of reflexes or even a wasting of your calf muscles. For sciatica sufferers, a good night's sleep may be a thing of the past. Simple things like walking, bending, turning, sitting or standing up can be difficult or impossible. Like most other conditions, sciatica has a wide variety of causes, but an unhealthy spine with a protruded or ruptured disc an irritate the sciatic nerve causing sciatica. Sciatica has been reported following accidents, injuries and even childbirth, usually due to spinal misalignment. However, advanced diabetes can also cause sciatic nerve irritation, as can arthritis, constipation, tumors and even vitamin deficiencies. The medical approach to sciatica is symptom treatment with painkillers, muscle relaxers and orthopedic devices such as traction and physical therapy. Sciatica is particularly frustrating to treat with drugs because, in many cases, even strong painkillers bring little or no relief. However, relief may be obtained by injecting painkillers directly into the nerve roots! As with all painkillers, there is always a risk of drug dependency. Orthopedic surgery may be resorted to if the pain persists. Chiropractors correct the vertebral subluxation complex, which causes poor spinal alignment and nerve pressure. Doing this, chiropractors relieve stress on the spinal nerves, joints and discs. Just as you get your car's alignment checked and corrected, so you should periodically get your spine's alignment checked out and corrected. Is chiropractic pinal care a treatment for sciatica? No, it is a procedure for the analysis and correction of spinal nerve stress. And yet, if you do have sciatica, a chiropractic spinal adjustment is very badly needed. Every sciatica sufferer needs a healthy spine. For over a hundred years, doctors of chiropractic have given spinal adjustments to millions of patients, many of them sciatica sufferers. During that period, chiropractors have observed the benefits that chiropractic subluxation correction has on many of those suffering from sciatica and leg pain; many sciatica sufferers have reported dramatic relief of their condition after chiropractic care. Many sciatica and leg pain sufferers have found that chiropractic was superior to traction and pain injections, often saving them from the prospect of having to live with pain, or perhaps face spinal surgery. Chiropractic care appears to have the most effect on sciatica when problems first occur. However, even in those who have suffered for longer periods and have been through the "medical runaround" (from specialist to specialist), chiropractic may provide excellent results. Too many people who suffer from lumbosciatalgia (lower back and sciatica pain), disc disease or protrusion think the only sources of help are drugs, physio-therapy and painkillers. Think again! Chiropractic care is the drug-free, natural alternative. In many cases of severe health conditions, it is still not too late to enjoy the benefits of chiropractic care, but please...don't wait. To millions of sciatica sufferers, chiropractic's unique approach to wellness has been a blessing. If the spine becomes misaligned or distorted, it could damage (impinge) the nerves it is designed to protect. The impinged nerves can upset the delicate workings of the body and set the stage for disease, pain and body malfunction. Throughout your life, you have your teeth, blood pressure and eyes checked-how about your spine? Contact Bailey Chiropractic Centre of High Point, North Carolina to help you with your sciatica and sciatic nerve damage pain.